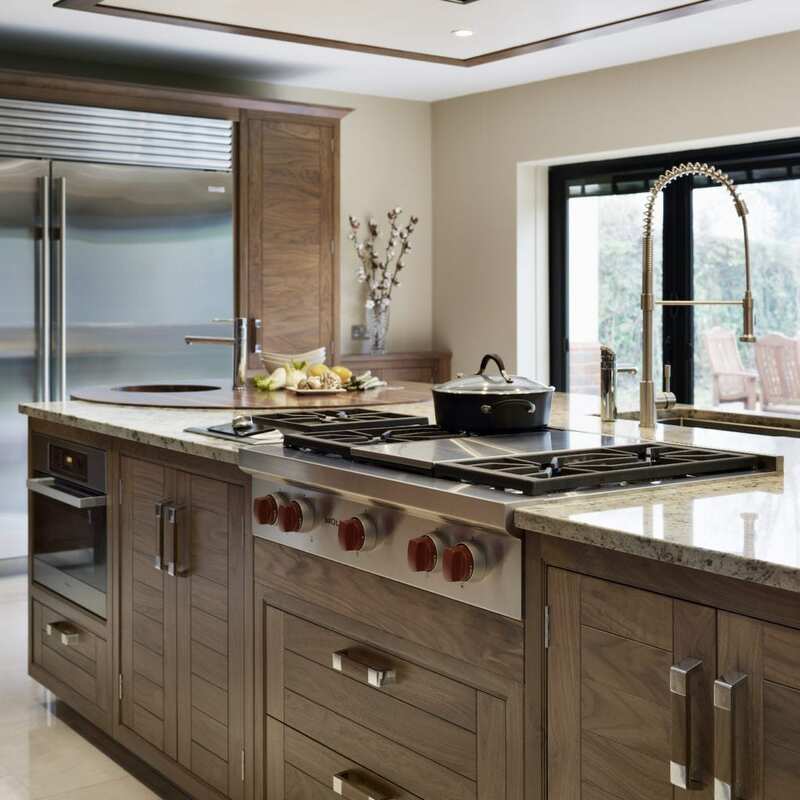 When Safraz and Zakiya were renovating their five bedroom family home in Chigwell they decided that it was the perfect time to get the bespoke kitchen they had wanted for so long. Bi-fold doors that spanned an entire wall were already in place, providing easy access to the garden and plenty of natural light. 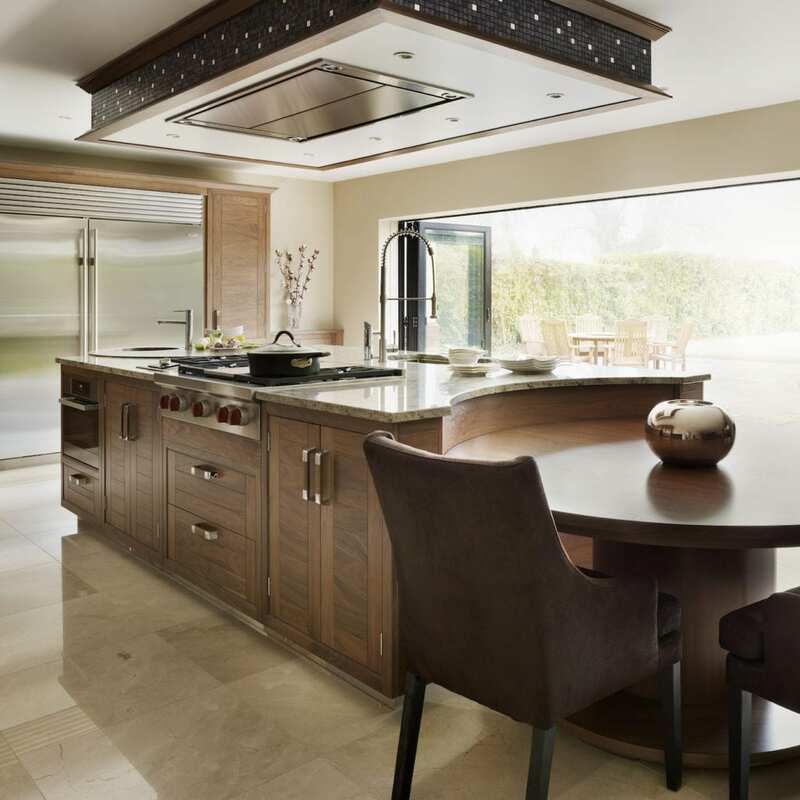 Add to this the sheer size of the space and it was clear that the kitchen needed to have a strong style but also be very practical to use for Safraz, Zakiya and their two sons. 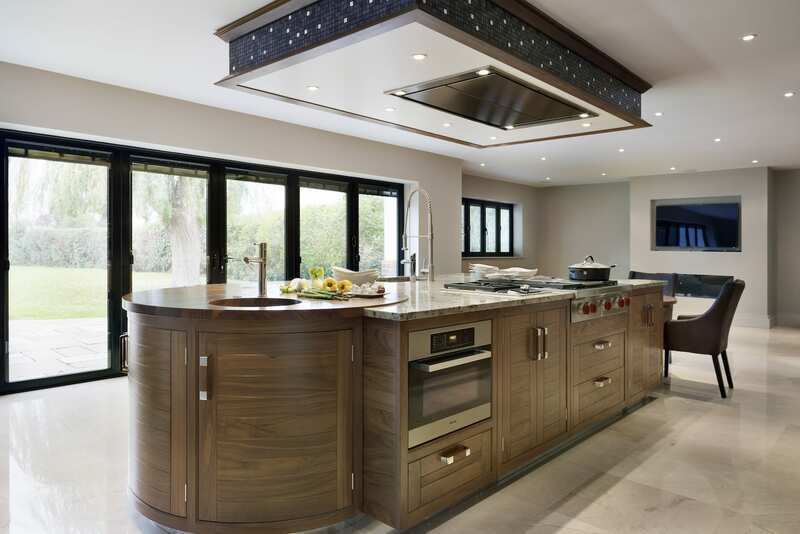 As a property developer Safraz had some preliminary ideas of what he wanted from the kitchen – it needed to have an island, feature curves and provide an area for the children to enjoy breakfast before school as well as be a space that makes entertaining easy. 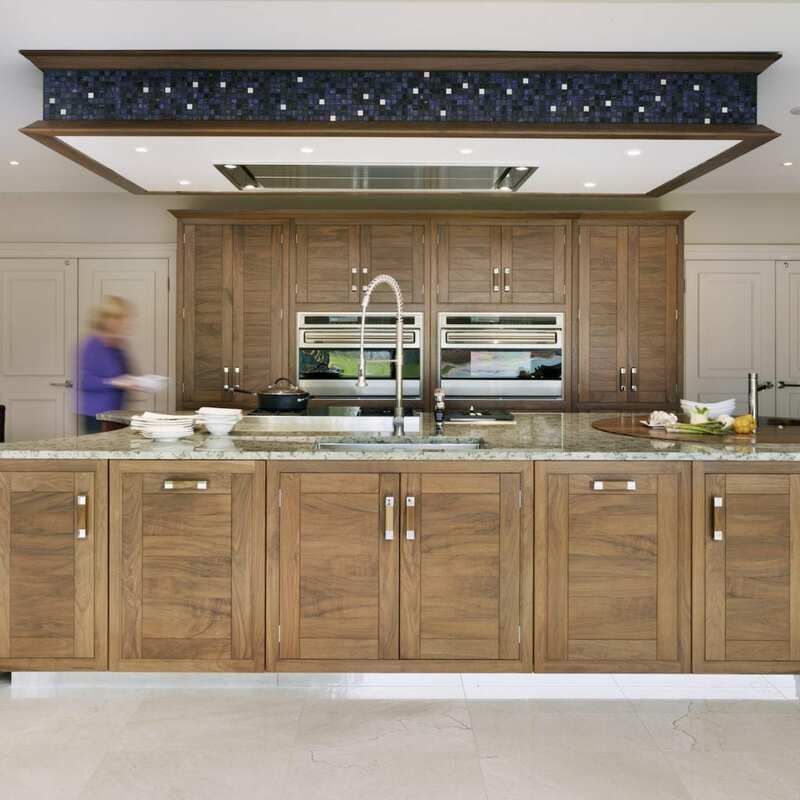 Safraz was also heavily involved in the aesthetic side of the design; “Safraz chose the walnut and style of the kitchen, it’s stylish, classy and in the space we needed a dark colour” explains Zakiya. As such, the Grosvenor collection was the obvious choice for a room of this size. 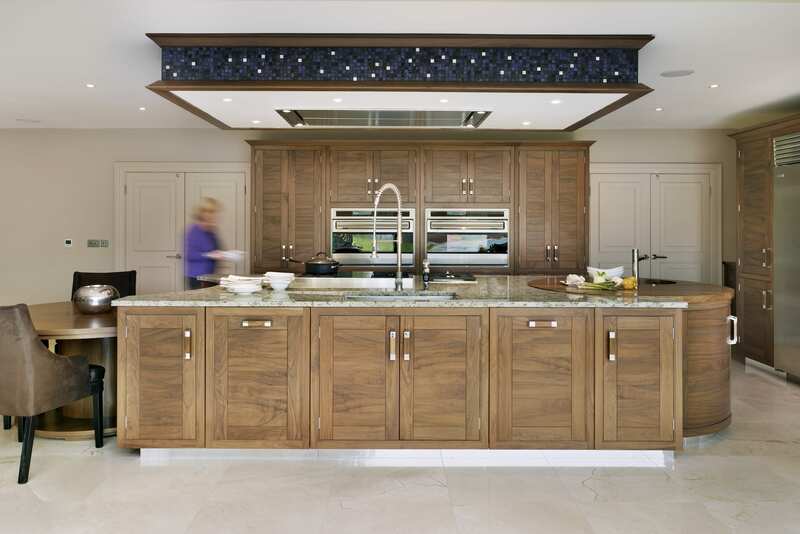 The richness of the walnut helped add warmth to the space whilst the ladder style door and polished Nickel detailing on the handles ensured a contemporary look that wouldn’t go out of fashion. With the aesthetic details of the design established, the ergonomics led the way. The large island became the core of the kitchen, providing the only work space in the whole room. Distinct zones for different jobs on the island ensured that having this sole work surface wouldn’t compromise on practicality. A prep sink, main sink and Wolf gas range top are all on the island, making it a space that moves from prepping to cooking to clearing with no interruptions. 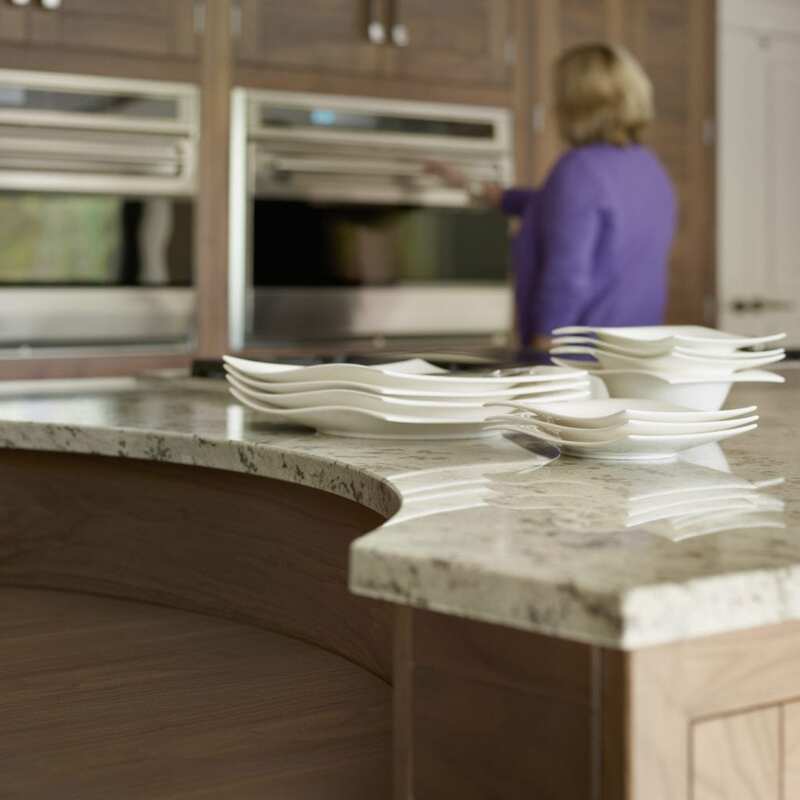 The couples’ desire for curves was fulfilled on both ends of the kitchen island. 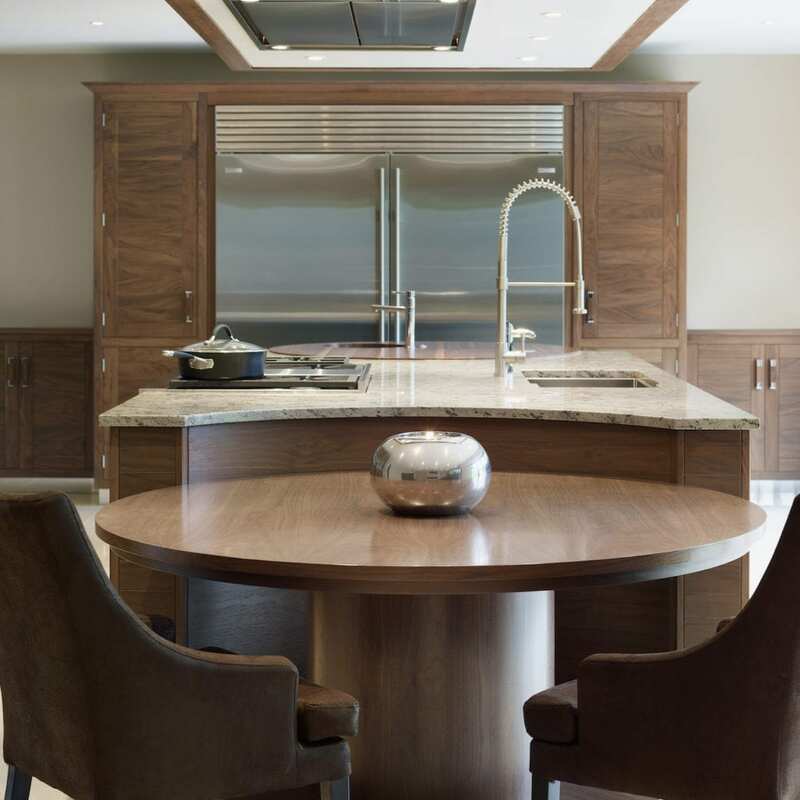 A bespoke dining table fits neatly into the concave end of the island providing the perfect place for their sons to eat breakfast before school. This table can be pulled away from the island, allowing seating all around it for when Safraz and Zakiya entertain for larger numbers. 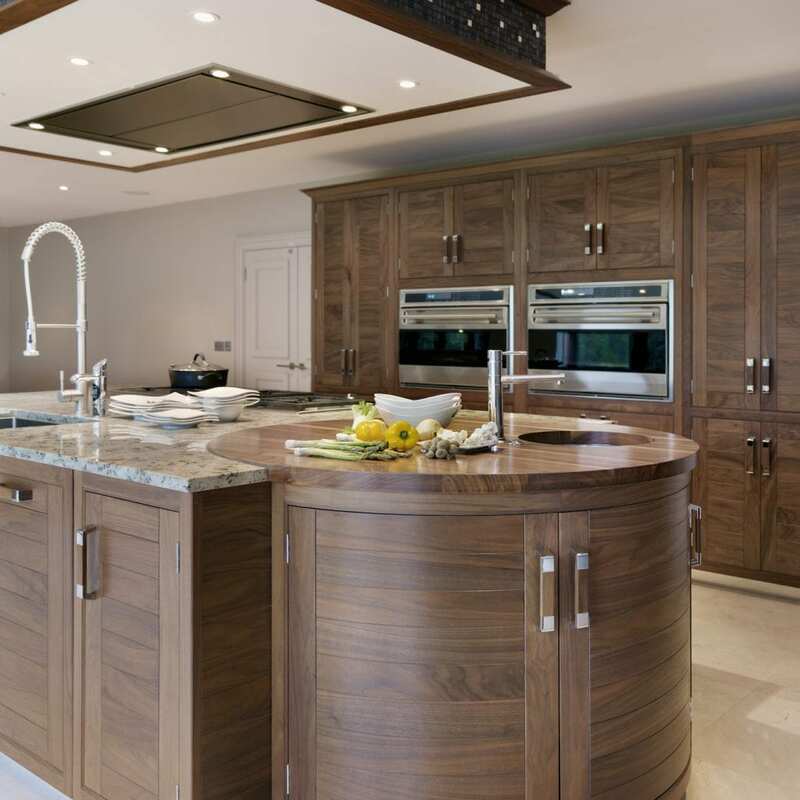 At the opposite end of the island is the prep area with convex curved cabinetry and a round walnut worktop. 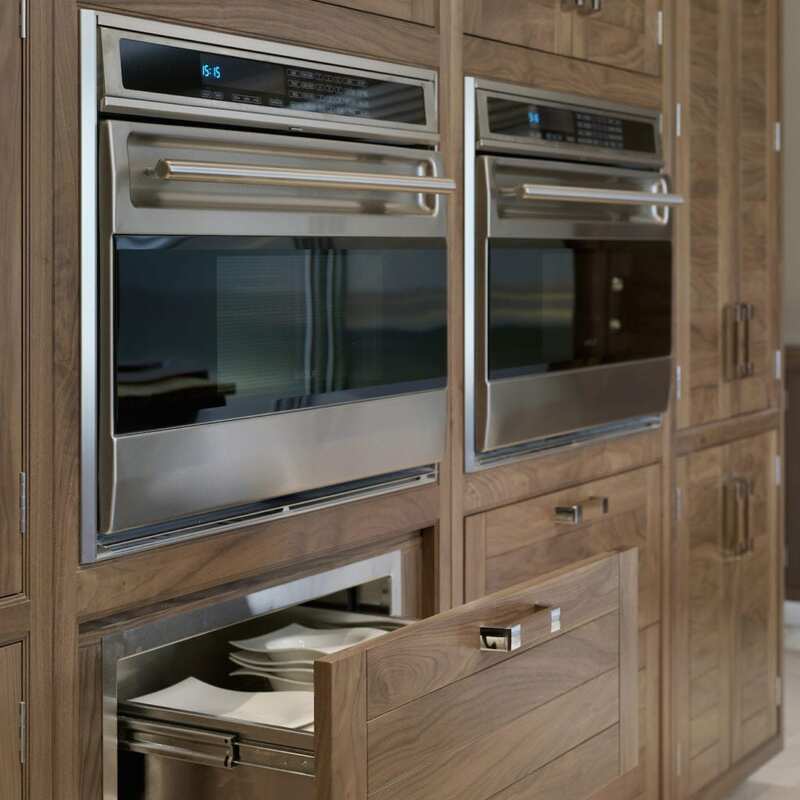 As keen cooks who enjoy hosting dinner parties, high end appliances were essential. 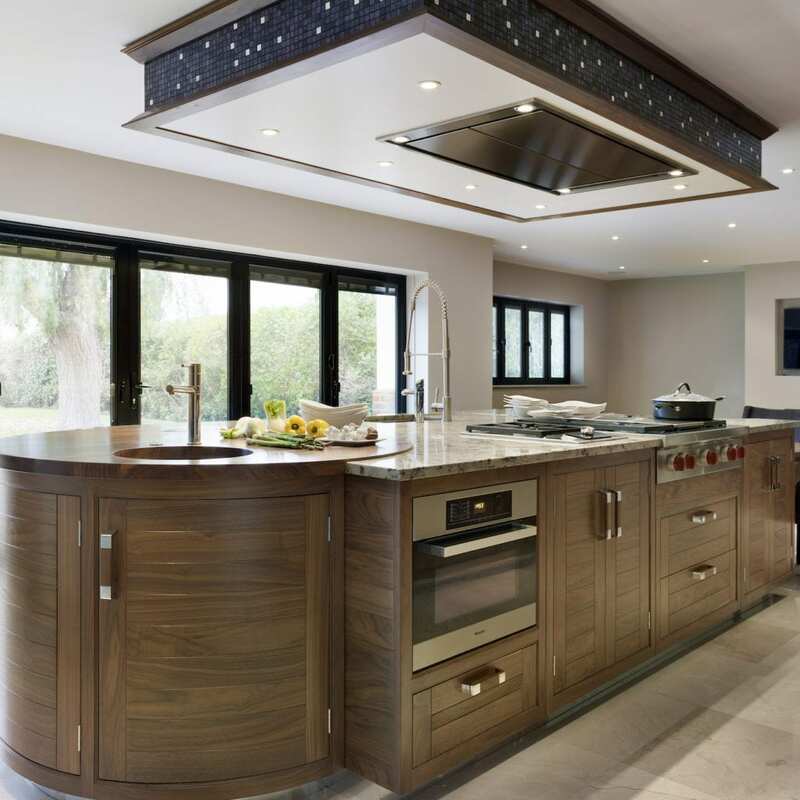 As previously mentioned a Wolf gas cooktop sits on the island with a bespoke Westin ceiling extractor positioned above to remove steam, odours and grease. As well as this there are two Wolf ovens and a warming drawer integrated into one bank of wall units. A side by side Sub-Zero fridge freezer sits at the far end of the kitchen, providing ample space for storing food before a party. The fridge is positioned behind the prep sink, making it easily accessible from the working area of the island. The stainless steel finish on the appliances adds to the contemporary feel of the room and echoes the plinth, helping to bring the room together as a whole. The result is that Safraz and Zakiya now have a kitchen that is perfect for their needs and is enjoyable to use. “We always used to have empty kitchen cabinets and drawers and cooking meals was always quite a chore as the family were in a separate room. Now we use all of the units and everyone is always using the space – the central island keeps everyone together, making cooking, dining and entertaining really enjoyable” concludes Zakiya.